Historic Kenmore was associated with gingerbread for decades. Many people’s first memories of Kenmore involve the square of gingerbread and a cup of tea that used to be served at the end of every tour. 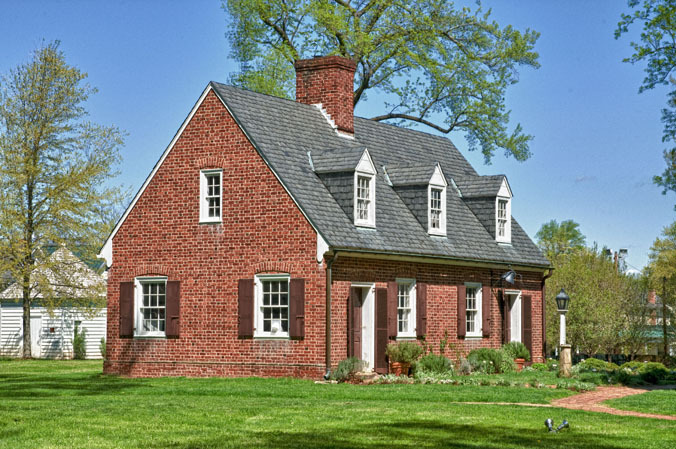 The dessert welcomed visitors to the world of colonial Fredericksburg, it comforted soldiers on their way to war in Europe or the Pacific, and, most important of all, it helped save the historic house itself. The ladies of the Kenmore Association, which owned and operated the historic home in the 20th century, took on a great challenge when they accepted stewardship of Kenmore. Raising the money to purchase the house was not the only obstacle they faced. They also needed funds to restore and staff the house. Unfortunately, the ladies drive to save Kenmore coincided with the Great Depression and the Second World War. Led by Annie Fleming Smith or “Miss Annie,” the ladies triumphed, kept Kenmore running, and even used the grounds to assist Fredericksburg in the war effort. They did all this with their indomitable drive and patriotism and with a little help from gingerbread. The beneficial partnership between gingerbread and Kenmore began in the early 1930s when the Dromedary Cake Mix Company launched a nationwide search for gingerbread recipes new and old. In the search, Mary Washington’s personal recipe was found in a cookbook owned by the Washington-Lewis Chapter of the Daughters of the American Revolution. It was tried and well-liked. The firm approached the chapter about producing the recipe as one of their mixes. Because the Washington-Lewis Chapter worked closely with the Kenmore Association in saving, restoring, and caring for Kenmore, Miss Annie and the ladies, being astute business women, brokered a deal with the company to benefit the historic home. 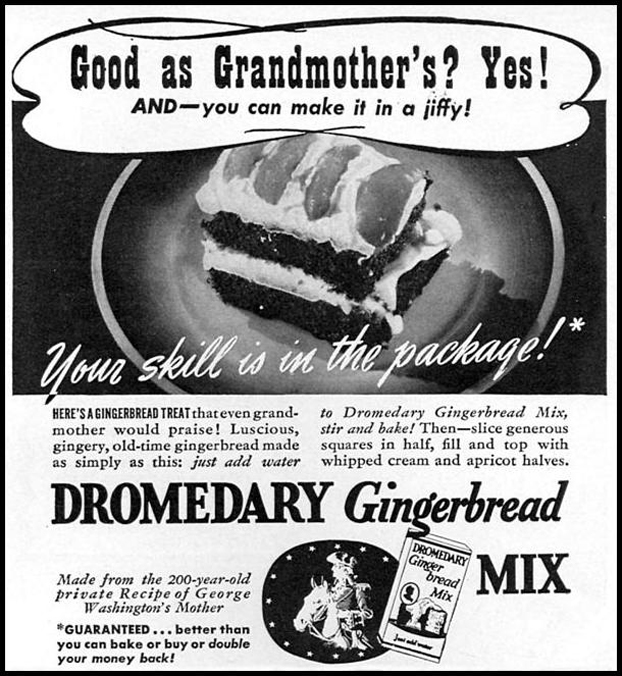 The arrangement allowed Dromedary to produce gingerbread mixes based on Mary Washington’s recipe. In exchange, the Kenmore Association got all the gingerbread they could serve to visitors. The company also donated mixes to be sold by the Association and various DAR chapters for 25 cents a box. The Association got half of the money realized from these sales minus the shipping costs. This agreement, in the end, earned the Kenmore Association over $38,000 – a hefty sum in the mid-20th century – and provided countless visitors with a yummy Washington family treat. In 1941, the United States entered World War II. Fredericksburg became a hub of activity with thousands of soldiers stationed at the A.P. Hill Military Reservation in Bowling Green visiting town to get a break from military life. 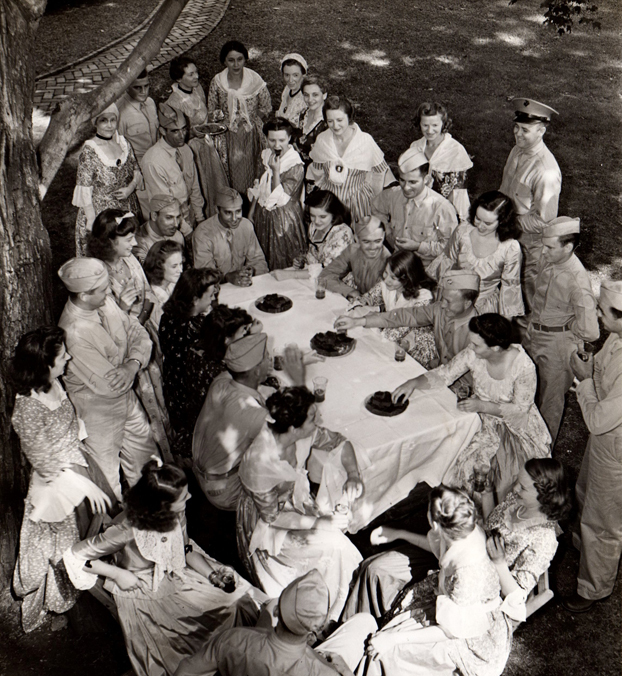 The Association’s ladies knew that Kenmore, with its historical and patriotic legacy, had a unique opportunity to welcome soldiers who would be fighting for the country and ideals that the Lewis and Washington families helped create. So, they threw open the gates, set out the picnic tables, and recruited local women to put on their colonial best and greet the men of the United States military. At the heart of this hospitality was iced tea and Mary Washington’s gingerbread. Servicemen enjoy gingerbread and tea on the grounds at Kenmore. During the war years, Kenmore hosted over 60,000 soldiers making sure each one was fed and knew his service was greatly cherished. The ladies of the Washington-Lewis DAR even took time to write each serviceman’s mother, wife, or sweetheart about their loved ones. C.R. 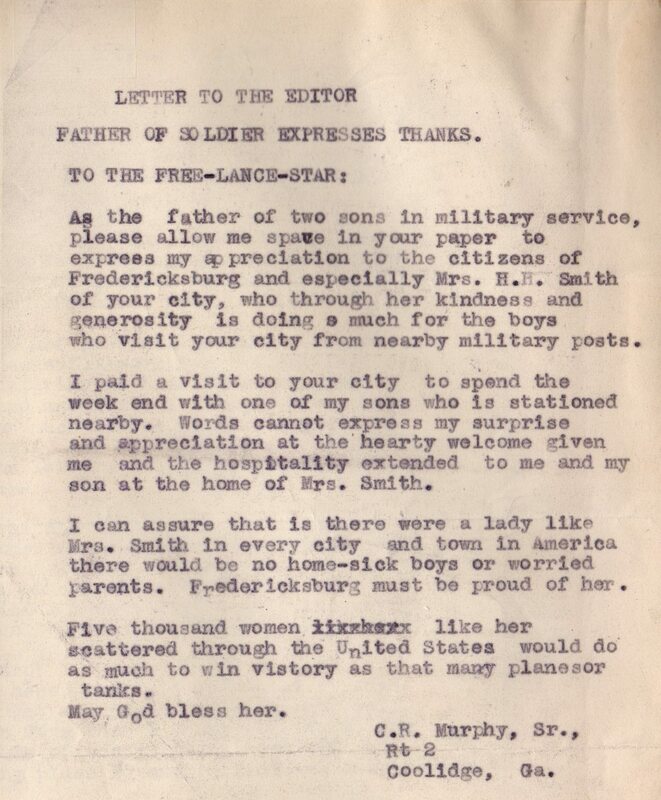 Murphy, Sr. of Coolidge, Georgia wrote The Free Lance Star to express his gratitude for Annie Fleming Smith’s (identified in the letter as Mrs. H.H. Smith) hospitality towards him and his son during a visit to Fredericksburg from a nearby military post where the son was stationed. The humble gingerbread recipe from Mary Washington’s cookbook gave Kenmore a perfect tangible link to its colonial past and bright future. The gingerbread that resulted assisted the ladies in their community outreach, their historic preservation, and their national patriotic duty. It was a sign of nostalgia, of hospitality, and most of all appreciation. 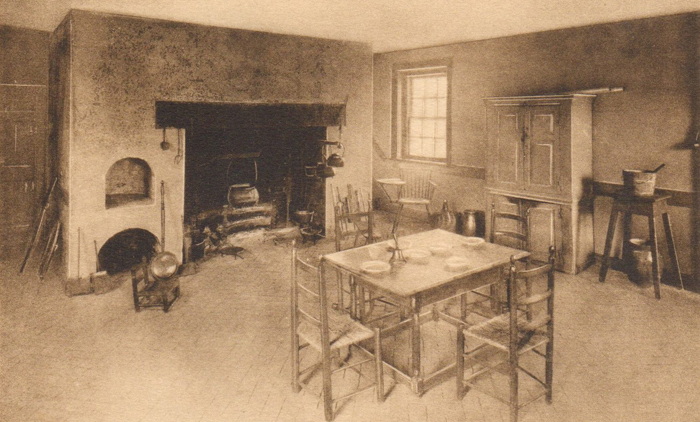 Today, when you tour Kenmore, our guides will happily take you through the reconstructed colonial kitchen that functioned as the Kenmore Association’s tea room. Regrettably, gingerbread and tea are no longer served to visitors because we do not have a fully-functioning kitchen. Gingerbread mixes and teas specifically created for The George Washington Foundation are available for purchase by anyone who might wish to relive their first taste of Kenmore’s famed gingerbread. The brick kitchen building next to Historic Kenmore is not original to the property. It was built in the 1930s in the colonial revival architectural style popular at that time. The brick construction does not reflect the kitchen building seen in the earliest known photo of such a building at Kenmore. That image, taken around the time of the Civil War, shows a large wooden kitchen to the north of the house as well two enslaved people standing in the kitchen yard. 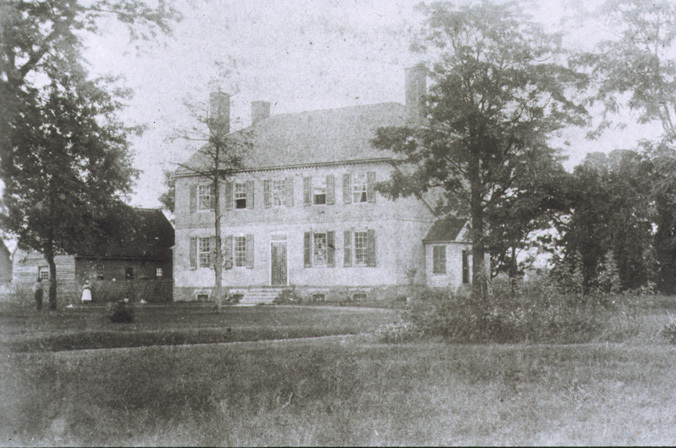 The wooden kitchen can be seen to the left of the house in this Civil War-era photograph. The Kenmore Association, a group of women who saved the mansion and transformed the property into a historic site open to the public, built the brick kitchen in the 1930s. Inside the brick kitchen just after construction was completed in the 1930s. Throughout much of the 20th century, visitors sat around the table in the photo above to enjoy gingerbread and tea served by the ladies of the Kenmore Association. Miss Annie Fleming Smith and other ladies serve tea and gingerbread to soldiers during World War II. Visitors enjoy tea and gingerbread in the kitchen. Several pieces of the china displayed in the cupboard in the background and the cupboard itself have been returned to the kitchen. Recently, we decided to highlight these ladies and their efforts to preserve Kenmore even more during our tours. We felt the most logical of places to do this was in the kitchen where they served their famed gingerbread and tea. We placed a tea set and faux gingerbread on the same table used to serve visitors for so many years. We surrounded that table with many of the same ladderback chairs, though most of their seats have been re-caned. We returned some of the china and the china cupboard that had stood for so long in the kitchen back to that space. While we cannot serve actual gingerbread and tea – modern-day museum guidelines prohibit food service inside historic structures – we can discuss the Kenmore Association’s monumental efforts to save Kenmore and make the mansion accessible to the public. You can read about these efforts here. Although it does not date back to Kenmore’s very beginning, the 80-year-old brick kitchen is still a part of the site’s centuries-long story. January and the start of the year are always a time of new beginnings. Recently, while digging through archival material, I came upon an exciting collection of newspaper clippings and photographs that detailed the New Year’s purchase of Kenmore and the beginning of the old home’s transformation into a historic site to be enjoyed by all. 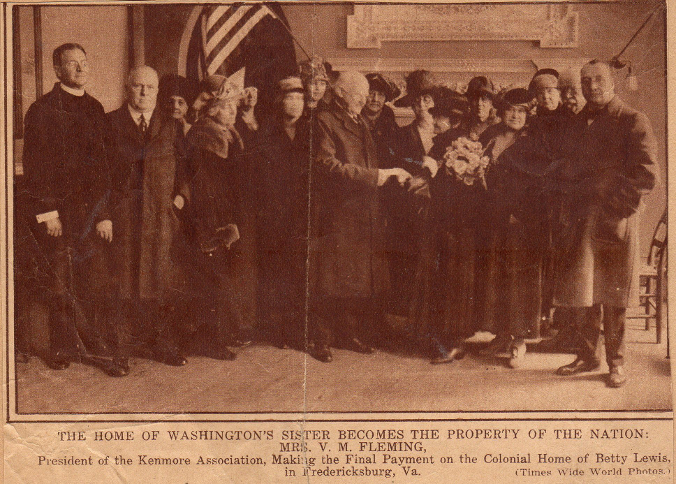 On January 1, 1925 — ninety years ago — a group of well-dressed women in hats and long fur coats assembled at Kenmore to hand over the final $1,000 payment and gain full possession of the house and land. This meeting was the culmination of thirty-two months of persistent work and determination by the ladies of The Kenmore Association to save the historic property from destruction. Emily White Fleming (identified in the newspaper caption by her husband Vivian Minor Fleming’s initials) makes the final payment to purchase Historic Kenmore on January 1, 1925. This crusade began four years earlier with a brief notice in the Fredericksburg Daily Star from Mr. E. G. Heflin, the owner of the Kenmore property. The announcement stated: “I have decided to build at once…6 or more modern up-to-date residence [sic] on Kenmore.” Built on a section of the plantation property, these houses prompted concern among many local citizens at the thought of further loss to the historic site. By 1922, the destruction of the old Lewis home seemed imminent. Mr. Heflin placed an advertisement for the sale of the house itself and cut up much of the original estate into smaller building lots to be sold to developers. If the house was sold, it might be remodel into apartments or just razed to the ground. This escalation increased the alarm even more and some tried to raise funds to purchase Kenmore. This attempt proved unsuccessful and the house did look to be lost. However, salvation appeared in the form of Kate Waller Barrett and the National Society of the Daughters of the American Revolution (DAR). In March of that year, Mrs. Barrett, Virginia Regent of the DAR, came to Fredericksburg with the purpose of organizing a new chapter in the town. She asked Emily White Fleming to lead the proposed chapter, which would work to save Kenmore. Mrs. Fleming was 68 years old and, though seemingly small and fragile, she, in reality, had a tenacious and determined spirit. She accepted the position and with the help of her daughter Annie Fleming Smith, known as “Miss Annie,” began their campaign to save the old Lewis house from destruction. The ladies approached Mr. Heflin and negotiated an agreement to the purchase the property. The group had to make a first payment of $10,000 within four months or the deal would be off. Furthermore, if Mr. Heflin got a satisfactory offer within those four months, he could go ahead and sell the property outright. It was a tough deal but the ladies rose to the challenge spectacularly. Mrs. Fleming and Miss Annie began fundraising immediately. They wrote hundreds of letters by hand, stating facts about Kenmore in simple, forceful style and then making appeals for help. Mrs. Fleming recalled, “I could write thirty-nine letters a day and Annie forty-nine. We never had a typewriter until the campaign was over.” In response to one of Mrs. Fleming’s letters, Colonel Isaac Newton Lewis, maker of the Lewis machine gun and a descendant of Fielding Lewis, contributed the first $1,000. Not to be outdone, The Colonial Dames of America in the State of Virginia gave a substantial donation of a $1,000 as well. Donation from Colonel Isaac Newton Lewis donated the first $1,000 to the Kenmore Association. 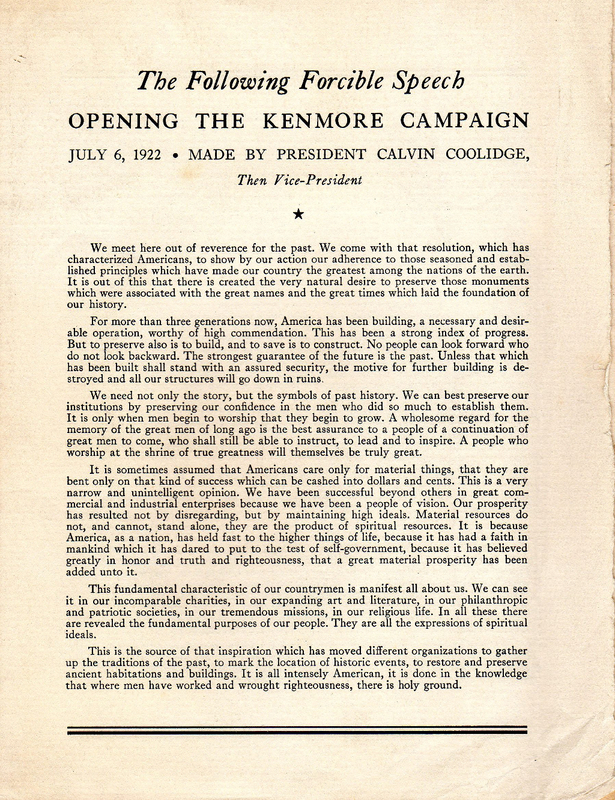 Speech made by Vice President Calvin Coolidge in support of the Kenmore Association’s effort to save the historic home. Through the efforts of this determined group of women, by the first of September 1922, they were able to pay an initial installment of $12,000 on the account. Impressed with the Kenmore Association’s work, Mr. Heflin made his own gift of $2,000. By New Year’s Day 1925, the hard work paid off and the ladies made the final payment and took possession of the property. Historic Kenmore was saved! Although the purchase of Kenmore nine decades ago certainly marked a new beginning, transforming the house into a historic site for the public to enjoy required many more years of work. Indeed, in many ways, the work begun by Mrs. Fleming, Miss Annie, and the Kenmore Association continues even as 2015 begins. In the new year at Kenmore, we will focus on refurnishing Fielding’s office and will soon hang portraits of Fielding Lewis, Betty Washington Lewis, and other family members in the Drawing Room. You can follow the year’s work here on the “Lives & Legacies” blog and on “The Rooms at Kenmore” blog, which is solely dedicated to the refurnishing project, at www.kenmore.org/wordpress. Like 1925, the year 2015 should prove to be an exciting beginning!